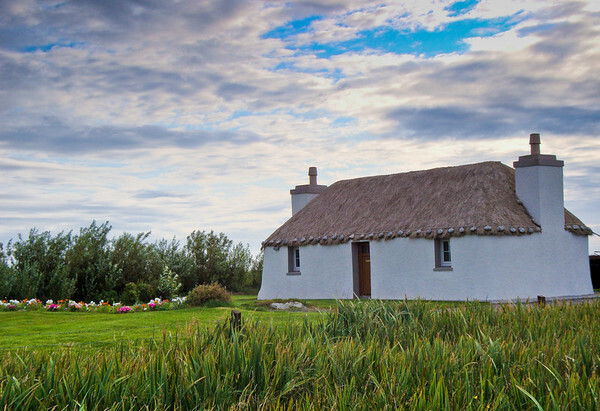 We had to look long and hard for a traditional Hebrides black house, and then the only ones we could find that were not ruins (and fully a third of the modern homes still have a black house ruin off to one side or behind) were fully modernized. I mean, windows? This example, now fashionably whitewashed and groomed, was just by the airfield and probably represented the retirement home of someone who served there. Still, character shows. Given the nature of the Hebrides roads (which I have mentioned before are one way…with pullouts for meeting oncoming traffic every so often…and those only on the major arteries) we were not able to do more than jump out of the car while it was still running in the lane and grab a shot. Lighting was not ideal with that bright sky looming up behind and little light on the foreground. Worse, the H50 suffers from unpredictable chromatic aberration. Purple and green fringes pop up at sharp, high contrast intersections in the image at certain settings of the zoom and in certain situations. I have never been able to track exactly what settings of the zoom and what situations, but this was one of them. Green fringes were readily apparent in a medium sized print or at normal screen resolution. Fortunately Lightroom has one of the best Chromatic Aberration tools I have ever seen. Sony DSC H50 at about 60mm equivalent. F5.6 @ 1/640th @ ISO 100. Programed Auto. In Lightroom, besides fixing the CA, I used two graduated filter efffects, one from the bottom to increase both exposure and contrast, and one from the top to darken the sky. The one from the bottom is of interest in that I slid a good portion of the darkest section of the filter off the bottom of the image, to give a more subtle graduation to the exposure increase. As usual with the H50, I added Presence (Clarity and Vibrance) and used the Sharpen landscapes preset. I looked for this shot every day in Scotland. Thistles with view. A few days I even found it. Ben More, with its cap of clouds was an irresistible subject anyway. This was taken at the same stop as 3/21/2009. and under the same circumstances, right over top of the rubbish tip. 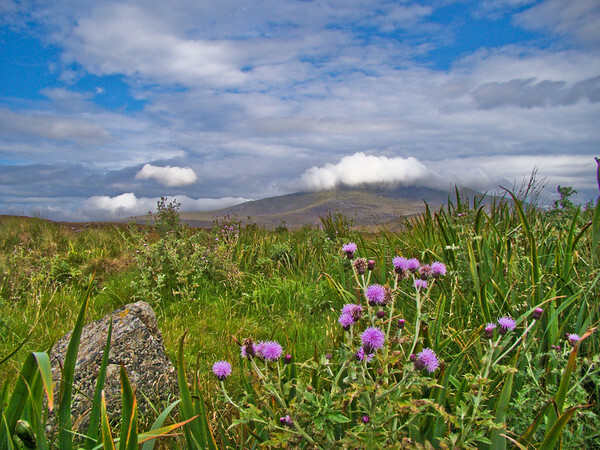 For this one I used Program Shift to select the smallest aperture I could (smallest the camera allows, F8) for maximum depth of field and shot form further back from the thistles, so I do have both the foreground interest and the mountain pretty much in focus. Post processing is the rest of the story. See below. Sony DSC H50 at full wide (31mm equivalent). F8.0 @ 1/500th @ ISO 100. Programed Auto with Program Shift. In Lightroom, I applied some Fill Light and Recovery…Recovery for the sky and clouds, Fill Light for the foreground, but even with my usual Presence boost (Vibrance and Clarity) it left the foreground flat (the foreground was cloud shadowed anyway). Even moving the black point right did not give it the pop I was after. I tried a Graduated filter effect from the bottom but that looked unnatural, so I went in with the Adjustment brush and masked the foreground. Using the mask I boosted exposure, added even more Clarity, and increased contrast for an almost HDR effect. As I have mentioned before, one of the features I like best about the H9/H50 cameras from Sony is the tilt out articulated LCD. It allows getting right down on the ground for images without actually laying down. It allows upward angles from ground level (something that is difficult even if you do lay down). In this case, laying down was not really an option unless I was willing to get wet all over. When you combine the articulated LCD with a very close macro ability, all kinds of new photographic options open up. 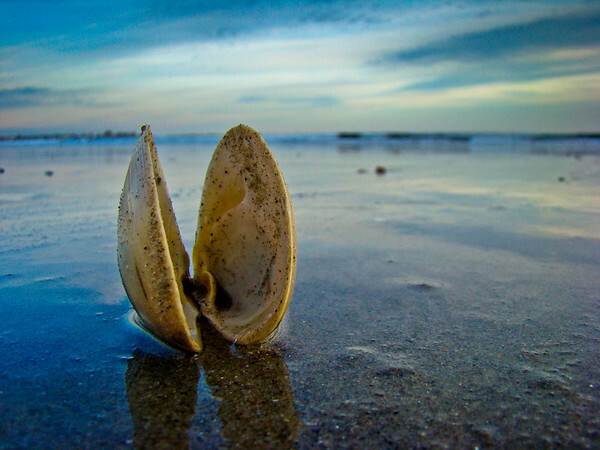 Just a shell on the beach, becomes a monument to shelldom. Sony DSC H9 at full wide (32mm equivalent). F5.0 @ 1/200 @ ISO 100. Programed Auto. Macro mode. 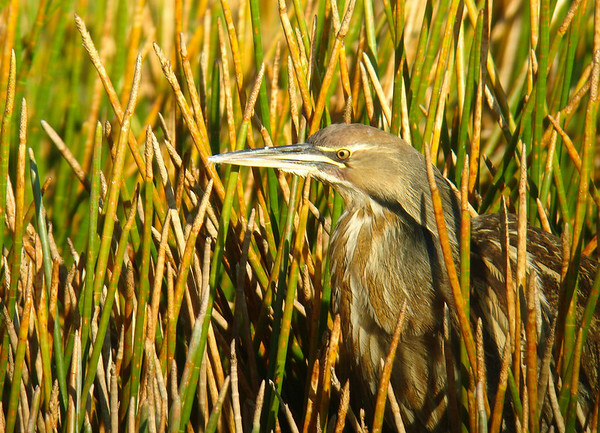 For the Bittern fans out there, and while we are on Florida Bitterns. 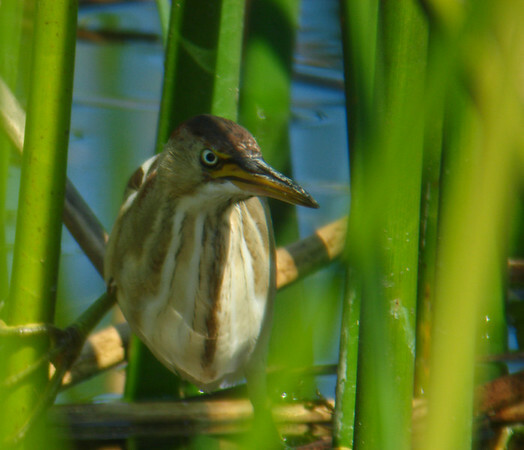 The American Bittern from yesterday was a gift. This Least was a stake out. People had been seeing this bird in this clump of reeds at Viera Wetlands for close to 2 mouths when I got there, and it was easy to find. Just drive up behind the 7 or 8 cars already stopped and ask where it was. It did take me several visits to the spot over the course of a morning to get a semi-acceptable view, as the bittern was not exactly posing for photo-opps. Eventually though I was able to get a line on her long enough to get a few decent shots. Sony DSC N1 behind the eyepiece of the Zeiss Diascope 85FL spotting scope at a total equivalent focal length of 2300mm. F5.0 @ 1/100 @ ISO 64 (F-stop limited by the scope). Programed Auto with selective spot focus. Minimal adjustments in Lightroom for Presence and sharpness (some Fill Light used to open shadows). 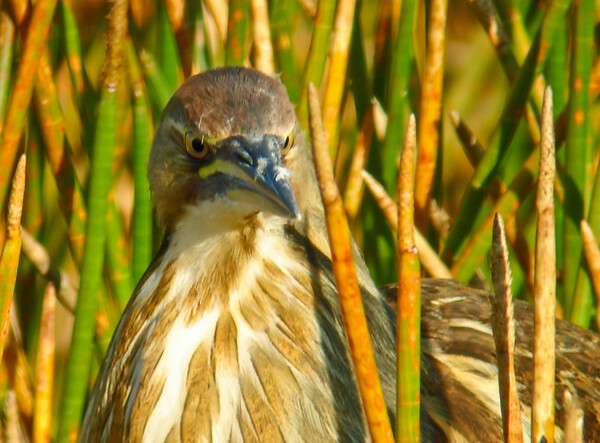 Revisiting Florida, and the Viera Wetlands, for a digiscoped shot of an American Bittern. A difficult bird to photograph. Digiscoping is mostly about being in the right place at the right time. Right bird. Right light. Success is directly related to the amount of time spent in the field. Of course you hone your skills…but again that is accomplished by spending a lot of time in the field doing it. Of course you learn your equipment, and you have assembled a kit that works for you. Once more, that happens through trial and error (lots of error), over a lot of time in the field. So, being ready when that perfect bird happens is important, but being there in the first place is critical. This bittern was the right bird in the right light. How could I miss? Sony DSC N1 behind the eyepiece of the Zeiss Diascope 85FL. Manfrotto 190 carbon fiber legs and a 701RC2 video head. Zeiss Digital Camera Adapter. Camera on Programed Auto, spot metering. F5.0 @ 1/100th @ ISO 100. Only the most basic processing for Presence and sharpness in Lightroom. One afternoon in Acadia National Park last summer I had what amounted to a macro holiday. There were mushrooms and lichen everywhere, and they were particularly photogenic (who knows why). You know how it works. You get tuned in. If you see one, if you see two, if you see three…then you are going to see hundreds because now you are looking for them. You are in macro mode. You are in the macro groove. 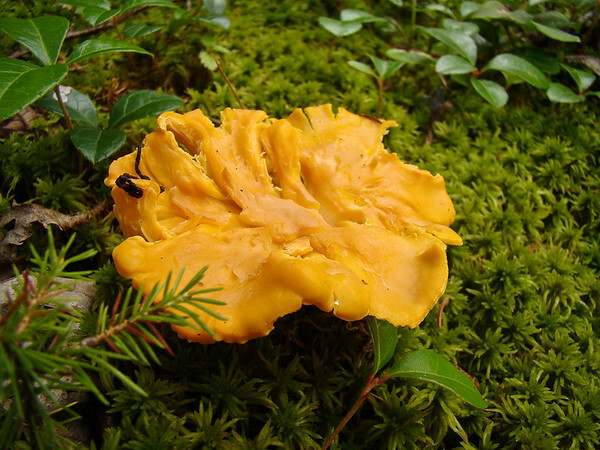 I found several stands of fruiting (flowering?) 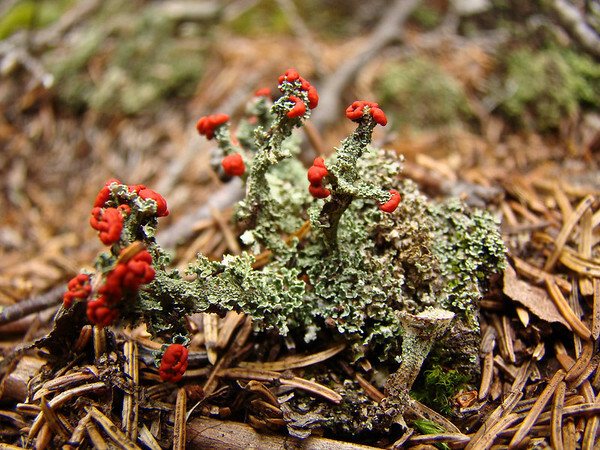 lichen, with bright red horns, and took maybe a dozen shots during the afternoom…widely spaced out among all the mushroom shots. This is my favorite. One of the great things about the Sony H50 is that, at the wide end of the zoom, it focuses to 2 cm. That is really, really close. (In fact, once while shooting in the rain and fog, the very similar previous generation H9 focused on a water drop on the outer lens element, just for an instant.) Macro focus at longer focal lengths is equally impressive. There are challenges to working this close, but it is really great to be able to do it at all without special attachments. The other great thing about the H50 is the built in, sensor shift, image stabilization. Stabilization makes shooting hand held at low shutter speeds possible (or much more possible). In the subdued light of the forest floor, stabilization gives you the freedom to work quickly and naturally, without complicated tripod set-ups. One of the challenges of working close is not getting in your own light. What made this day ideal for macro work was that the light level was fairly bright, but high overcast above the tree canopy made the light diffuse. No heavy shadows and enough light to work. Ideal. I could generally find a well lighted angle on almost any macro subject. For this shot, I backed off a bit from closest macro, and zoomed up to about 40mm equivalent to frame the full cluster of lichen. Lichen with the Sony DSC H50 at about 40mm equivalent. F3.5 @ 1/60th @ ISO 100. Programed Auto. Only the most basic sharpening and presence adjustments in Lightroom. From Acadia Shrooms and Lichen. The whole gallery is worth a look. One amazing macro day. Just for fun. Every once in a while you catch a day. This day we were out on the Puffin cruise and I saw this opportunity forming. I waited and drove to the top of Cadillac when the light was right. It certainly paid off. This is not the first image from that day I have posted. 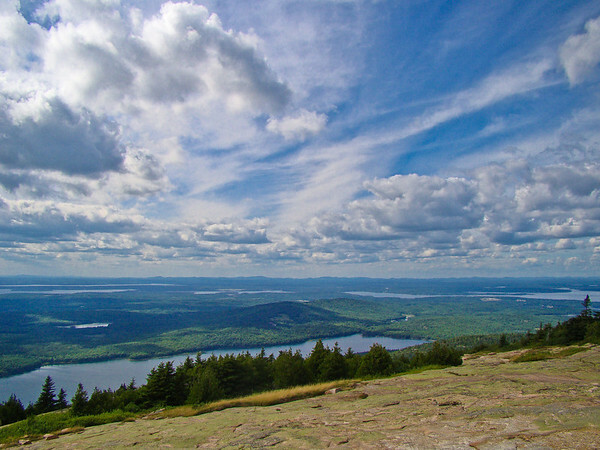 Looking West and South from the Cadillac summit, standing at Bluehill Overlook, out across Eagle Lake and Bluehill sound beyond. Sky that knows no end. Sony DSC H50 at full wide (31mm equivalent). F5.6 @ 1/800th @ ISO 100. Programed Auto. In Lightroom, Recovery for the sky and clouds. Some Fill Light for the foreground. Added Clarity and Vibrance in the Presence panel. Landscape Sharpen preset. Someday I will go back and rework this with Graduated Filter effects. From Cadillac Mountain Sky Day. An alternative version using Lightroom’s graduated filter effects.